On December 19th, 2015, Rob Brady was interviewed on Ask the Experts, a weekly program on 570 News highlighting local businesses. Listen for our radio ads too! We will be accepting donations to First United Church's Out of the Cold program during our business hours. Looking to give a gift of good, healthy food this holiday? Brady's now sells gift cards! Visit our store to pick one up! Vote for us in the Top Choice Awards! We've been nominated for the Top Meat Shop of 2016 in Kitchener/Waterloo by the Top Choice Awards! Please vote for us and your other favourite local businesses! Read more about Vote for us in the Top Choice Awards! Read more about Order your Christmas Turkeys today! Vote for us in the 2015 Record Reader Awards! 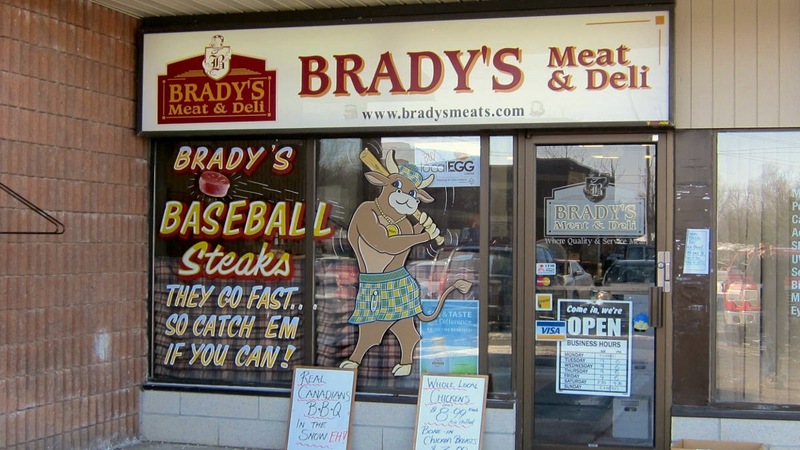 Brady's loyal customers have nominated us in 4 categories in the 2015 Record Reader Awards: favourite butcher, favourite delicatessen, favourite place to get a sandwhich, and favourite specialty food shop! Please show your support by voting for us today! Read more about Vote for us in the 2015 Record Reader Awards! Thanks for your support Waterloo! We're proud to announce that the readers of the Waterloo Chronicle have voted Brady's Meat & Deli diamond in the butcher/meat shop category, and platinum in the delicatessen category! Thanks to our loyal customers for your support! Read more about Thanks for your support Waterloo!